Aircraftscales.com a division of Jackson Aircraft Weighing Systems LLC provides Aircraft scales, Aircraft Weighing Equipment, Helicopter Scales and Large Jet Under Axle Weighing Systems for all your aircraft weighing needs. 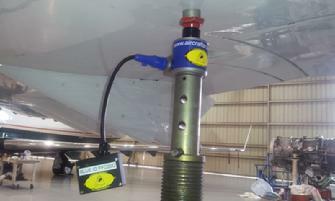 Making Aircraft scales, helicopter scales, and aircraft weighing equipment easy to use, cost positive to own and highly reliable for the aviation and aerospace industry since 1993. 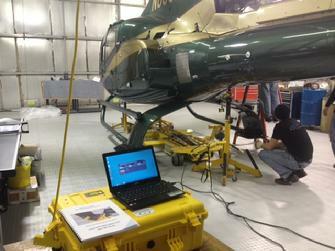 Wireless Aircraft Scales, Wireless Aircraft Weighing, we have the wireless systems available to meet your needs. Laptop comuter based or the HH hand held series featuring our hand held transceiver. M2400-3-10CS $6,995.00 Three 10,000 lb load cells with laptop computer or our HH Hand Held tranceiver, just take a look at the picture of our virtual scale screen shot, it will look just like that on your laptop or tablet! Shown here, our laptop version of our M2400-3-10CS wireless system. Our HH2400 series system featuring our Hand Held tranceiver, no wires, no outlets, and easy to use. The JAWS100 data logging software allows the viewing, logging, visualisation and browsing of up to 100 channels of data from the M2400 range of telemetry acquisition modules. Displaying each value in a resizable window, channels can be setup with user defined algorithms that can be used to calculate a multitude of maths functions. For example, a display can show the value from a single acquisition module or the sum of multiple modules. Visual displays and audible alarms can indicate under and over range as well as loss in communications, low battery and error reports. JAWS100 can log on demand, at pre-set intervals, on entering and leaving a pre-set overload and during an overload. It creates a CSV file which can be loaded for analysis into software programs such as Microsoft Excel. The software has a built in web server to provide a summary view page to other computers, tablets, iPads and smartphones etc. using a standard browser. This is licenced software to Jackson Aircraft Weighing Service DBA www.aircraftscales.com and comes pre loaded on our laptop computers which are included with the kits. As a rule of thumb if you want to log at once per second or slower then you can pretty much use any computer. There are some performance settings in the Preference Window that can help the software feel responsive even on slower computers. See the 'Preference Window' for the following settings. The speed of your processor and graphics card can make a big difference to how responsive the computer is as you resize the software main window. On faster computers you can enable 'Show Displays' while resizing. If the software determines your computer is fast enough, it will enable the option of 'Realtime Chart Update'. On slower computers (or logging at high speeds) you may not want to enable this as it can reduce the logging speeds achievable. Remember that just because the software allows you to log up to 200Hz (5ms interval), depending on the number of display channels, and the complexity of the display channel expressions, you may not be able to achieve the desired rate. Unfortunately, due to the number of variables in both the computer and the software, configuration it is not possible to accurately predict what is achievable. For example, the software will not be able to log at 200Hz when 100 channels have been configured. M2400-3-25CS $7,495.00 Three 25,000lb load cells with laptop computer or our HH2400-3-25CS with our hand held transceiver. Wireless cell 737 main jack point detail shown with our large jack adapter being used on the customers jacks. Our 5.0 OTJA jack adapter is shown here. Have old jacks with no hole? No problem, we offer our jack adapters in two sizes to retro fit your older jacks for weighing use. Just click the picture to go to our jack adapter page. Our wireless load cells are equipped with a module that runs on AA standard Duracell or Energizer batteries, no need to plug in units and charge. If a unit goes dead, all you have to do is change out the batteries with new ones, even under load, our unit maintains its capability to hold and transmit your data. Load cells are managed to wake or sleep as needed to reduce draw on power, making use and storage easy. We have four cell kits available in four weight ranges. Our three cell kits can be upgraded to a four cell kit if requested. Standard laptop is used running Windows 7 or 8 and we can also use your laptop if requested. Our system is USB based and plugs into the USB port on the computer. Our antenna is positioned on a small tripod (included) and points toward the load cells. Each cell is positioned with the transmitter hanging from the load cell, unlike others with bulky transmitter boxes and or large area modules connected directly to the load cell. Ours just hangs out of the way for easy placement and no interference with the surrounding structure. Our cells use our radial load cup for excellent retention and jack point location just like our wire type kits and have the same accuracy. Sealed water-proofed wireless sensor network unit designed to integrate with load cells. Network capable allows several load cells to be active and used for differant applications. The integral antenna supplied on the module, USB antenna supplied for laptop computer, PC or tablet operation. The high accuracy, low noise measurement deliver high resolution, low drift results which can be user calibrated over 9 points to enable linearization and to deliver results in user definable engineering units. The results can be transmitted at rates up to 200 per second to other devices such as handheld tablet, PC or the standard laptop computer supplied. The module is configured and calibrated (either by applying known inputs or by table entry) on a PC connected to the base station.